The toilets are installed by the plumbing crew. These toilets are highly efficient water saver toilets that utilize only 1.6 gallons per flush. Let us start with the basics. For one, there has to be the toilet bowl itself. For that, you actually have various types when it comes to the size, shape and height of the toilet bowl. Your choice of a toilet will be depending on your needs and preferences. Another feature that all toilets have is tanks inside them where the water is stored until the time that you flush the toilet. Just as with toilet bowls, the toilet tanks also vary in terms of designs. The next feature is for the toilet flush itself. When it comes to this factor, you must know though that there are actually federal guidelines as to the volume of water that can be flushed in a toilet. Thus, you must make it a point that the toilet of your choice will have a flush that adheres to this standard, but gives you efficient performance as well. Of course another feature to consider is the toilet seat. Usually, these are already included in the kits of the tank/bowl. If you want a different design and color for your toilet seat, then that can be possibility. The different features that you will find in toilets vary by the kind of toilet that you are working with or that you are planning to purchase. To make that idea clearer and to give you a heads up as well, here are some examples of the various features of toilets that can be found in its different types. One of the most common and popular choice of toilets all over the world is the pressure-assist toilet. These are known for their feature wherein they have improved flushing performance as compared to the other types of toilets. This is especially true when, say for instance, the pull of gravity in gravity toilets is not adequate to pull the water through with the use of the plumbing. This type of toilet makes sure that air pressure is kept inside the plastic tank. Therefore, when water is stored inside the tank, it is placed under tremendous air pressure. Hence, the loud whoosh that you hear when you flush the toilet. Another type of toilet is the vacuum-assist toilets. Here, you will find a vacuum chamber inside the tanks house itself. This vacuum chamber then functions like a siphon so that air will be pulled out of the trap below the toilet; thereby filling the toilet with water to clear the waste. Dual flush toilets are becoming more popular nowadays. They are great for saving water. The dual flush system uses 50% less water than conventional toilets. They are simple to use, push the right button for solid waste or push the left button for liquid waste. The liquid waste button uses half the water as the solid about .75 gallons. Other features included are a 4-inch trap that is practically clog proof also. There is less water in the bowl in these types of toilets; therefore, it reduces the load on your septic system. These toilets are seen in many green buildings and hotels. Last but not the least, there are the power-assist toilets. This type of toilets has a feature that uses electricity so that it can power the pump that will push the water into your toilet. This type of toilet plugs into a standard ground fault circuit interrupter outlet. 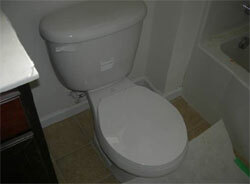 Those are just some of the various and special features that you will find in specific types of toilets. Ultimately, toilets have many different features. The more sophisticated the toilet is, the more special features you will find in them. Remember, the key here is to go with the toilet that will satisfy your needs and preferences.